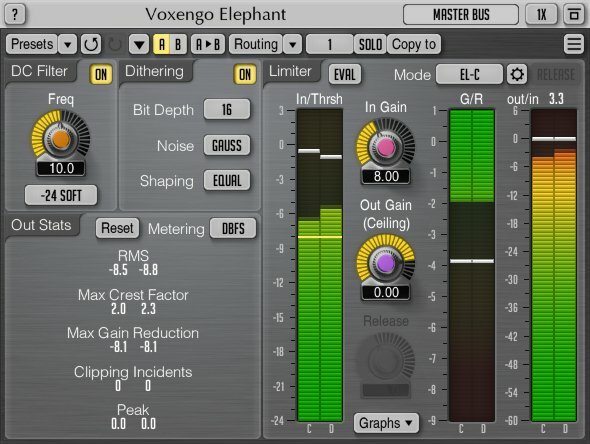 Voxengo Elephant is a mastering limiter plug-in for professional music production applications. The most remarkable feature of this signal limiter is its sonic transparency. 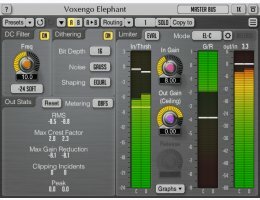 Elephant brings sound limiting and loudness maximization without audible "fuzz" and "pumping" sonic artifacts. Elephant is a highly competitive plug-in for mastering applications: it features a variety of limiter modes that can be deeply customized, and a comprehensive set of level metering tools, including headroom estimation and K-system metering. Elephant's built-in linear-phase oversampling is an important element in achieving high-quality peak limiting and loudness maximization without inter-sample overshoots.